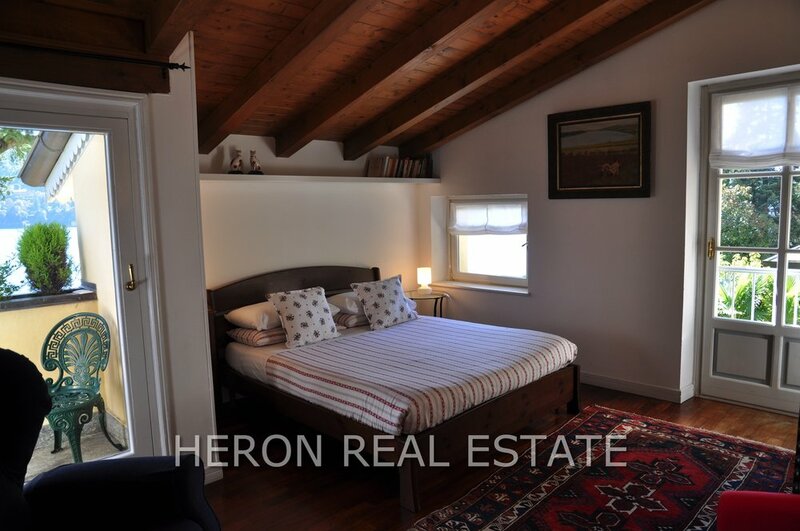 Charming detached residence in Unique Settings with large Terrace and private Parking in Torno at Lake Como. Situated less than 30 m from the lake in a quiet lower lake road location in Carate Urio, this property boasts commanding views of the lake and the mountains. This classic villa is set on 3 floors and is in move-in conditions. The ground floor consists of a large and bright living and dining room with parquet flooring and fireplace, a powder room, and a modern kitchen with access to the garden with a wonderful covered, panoramic terrace with barbecue. The first floor accommodates two bedrooms, two bathrooms, a study, and two terraces. The top floor is composed of two bedrooms with a/c, a bathroom, an ironing room and two terraces. All floors have access to the garden to the rear side. The terraced garden is easy to maintain and offers space for a small pool or jacuzzi. The villa is accessed through a private gated entrance and has private parking for 4-5 cars and a cellar room. The location in Carate Urio, a very sought-after lakeside town with several excellent restaurants and bars, and less than 10 minutes’ drive from Cernobbio, Como and the motorway connecting Milan and Lugano, makes it ideal as a first home for a family as well as a holiday home. Diese Immobilie befindet sich in ruhiger Lage an der Via Regina Vecchia in Carate Urio, weniger als 30 m vom See entfernt. Von fast allen Räumen hat man einen wunderschönen Blick auf den See und die Berge. Diese klassische Villa erstreckt sich über 3 Etagen und ist bezugsbereit. Das Erdgeschoss besteht aus einem großen und hellen Wohn- und Esszimmer mit Parkettboden und Kamin, einem Gäste-WC und einer modernen Küche mit Zugang zum Garten mit einer tollen, überdachten Panoramaterrasse mit Grillplatz. Der erste Stock beherbergt zwei Schlafzimmer, zwei Badezimmer, ein Arbeitszimmer und zwei Terrassen zum See. Das Obergeschoss besteht aus zwei Schlafzimmern mit Klimaanlage, einem Badezimmer, einem Bügelzimmer und zwei Terrassen. Alle Etagen haben Zugang zum Garten hinter dem Haus. Der terrassierte Garten ist pflegeleicht und bietet Platz für einen kleinen Pool oder Jacuzzi. Die Villa ist durch ein zur kleinen Residence gehörendes Eingangstor zugänglich und verfügt über einen privaten Parkplatz für 4-5 Autos und einen Kellerraum. Die Lage in Carate Urio, eine sehr begehrte Stadt am See mit mehreren ausgezeichneten Restaurants und Bars, und weniger als 10 Autominuten von Cernobbio, Como und der Autobahn nach Mailand und Lugano, macht dieses Anwesen ideal sowohl als Haupt- als auch Zweitwohnsitz für eine Familie.